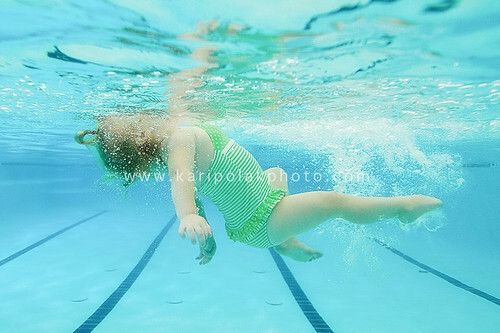 The smell of chlorine always takes me back to early childhood. Today we walk towards a swim instructor that looks no more than 18. Gingerly, I scooped you and took a deep breath as I waited for your shriek. You raise your knees to your chest anticipating the cool water at your feet. I hand you over, and it is I that suddenly feels a pang of anxiety. Soon you are splashing in the water and high fiving your instructor. "Up and Under" they chant all around… I see your little head go under water and instinctively you come up for air. "Up and Under" they chant. I gasp as I sit nearby watching it all. The lesson is soon over, and I reach the edge of the pool to collect my little fish. My eyes filled up as you are smiling broadly! "I didn’t know she was so brave," I cried! You wait for no one as you jump off the pool step. At first it seems you might be too shy to do it. Your hands are clasped at your chest as you lift your right leg push off with your left you raise your arms and smile at your mami as I catch you!